Siri-ously beautiful, a photo by The Bacher Family on Flickr. I just downloaded the photos from my cell phone, taken over the last few months, and I'm seriously impressed by the quality of a few of the images captured by my iPhone 4s. If the lighting is poor, the quality's not so good, but in decent light the images aren't half bad, given that you're working with a quarter-inch lense on a camera body only about 3/8 of an inch thick. The color reproduction is good, and the detail is decent if you don't zoom in too close. Of course, the most important thing in any picture is composition, not camera quality; and it's nice to have the option of snapping an artistic image even when you don't happen to have the heavier camera on your shoulder. I spotted this view looking back at the trail in the Ashford County Park last November as I was checking on one of my geocaches. 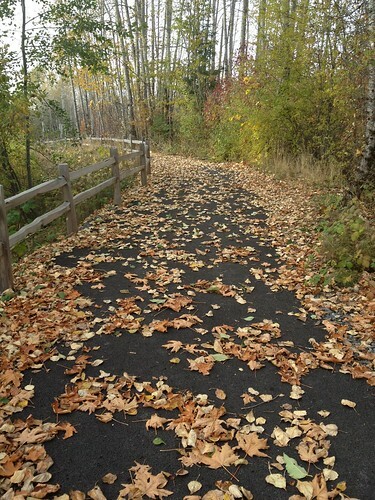 I loved the random pattern and colors of the autumn leaves turning brown on the pavement, and the way the lines of the trail and fence curved away gently into the distance, contrasting with the strong verticals of the trees. Here's a link to some of my other favorites from last year's set of cell phone pictures.